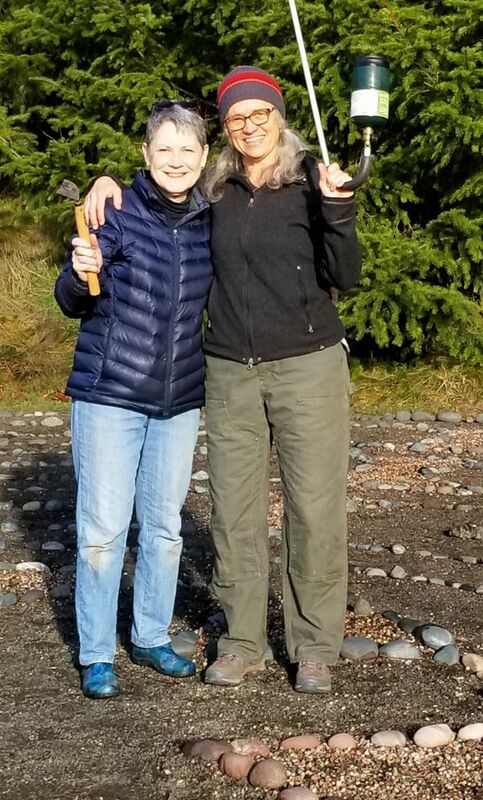 Recently on a beautiful sunny day, a small ceremony took place in the labyrinth for the passing of the weed torch from Fran Moen to Kathie McCarthy who a number of years ago had passed the torch to Fran. Beginning about the year 2000, Kathie spent two years designing and creating our 11 circuit Chartres style labyrinth.Having been in place for only a year, the labyrinth was found to be in the path of the upper parking lot being created for our new church building. Thanks to much hard work including by a group called "Our Ladies of the Buckets," the labyrinth was disassembled and rebuilt on its current site. Kathie and others continued to maintain the labyrinth working to keep in clear of weeds and making it available to any and all who want to walk it. In 2010, Kathie's work and family responsibilities precluded her from being able to tend the labyrinth and Fran Moen stepped into the job of being the Labyrinth Keeper because its benefits were so great – no committee meetings, work environment was beautiful, and the schedule had ultimate flexibility. For the last 8 1/2 years Fran has carried on working with others from time to time but mostly alone as the work was so satisfying. Kathie now has time in her life to return to overseeing the labyrinth, and Fran is finding she has less time to devote to the required tasks.Kathie has graciously agreed to accept the torch back – a lovely gift to Grace because, of course, she knows this sacred space better than anyone else! If you are interested in participating in an occasional work party to keep the labyrinth in tip-top shape, please contact Kathie McCarthy. Just know you may find the work so fulfilling that the torch might be passed along to you sometime in the future.